With cold and flu season upon us, it’s a great time to purge the medicine cabinet. 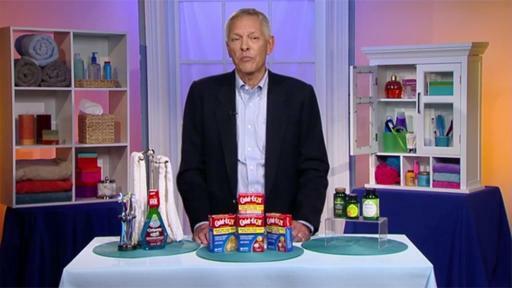 Pharmacist and Professor of Pharmacy and Therapeutics, Dr. Ed Krenzelok shares his important tips to help get rid of overly packed medicine cabinets and stay up to date on the latest health innovations. WHEN IN DOUBT, THROW IT OUT: Once you’ve opened a medication the clock starts ticking on its shelf life. Items like that are usually good for about a year from when they’re opened. EVERY DAY BASICS: A variety of illnesses are common during the winter months. Basics include good oral hygiene and it’s very important and it starts with clean teeth. A good product is Colgate Total® Advanced Health Mouthwash. It has a unique shake-to-activate formula that combines two different liquids into one powerful, bacteria-removing mouthwash and can remove 24x more bacteria for a healthier mouth. All you need to do is simply shake to activate and then rinse to clean! With this innovative formula, you’ll see the results in your sink. No one wants a cold to persist, so don’t let is slow you down. Medical studies have shown that zinc gluconate that is found in Cold-EEZE lozenges shortens the duration of a cold so you can Feel Better Faster! Pharmacists have named it the number-one recommended brand of zinc lozenge. And it’s also available in 2 other convenient forms; the Gummy and QuickMelt. OTHER ESSENTIALS: While antibiotics are often used to cold and flu, they can disrupt your balance of friendly and unfriendly bacteria, creating digestive discomfort. Probiotics are a great medicine cabinet staple because they help balance healthy bacteria levels in your gut and, since 70% of your immune system lives in your digestive tract, they support a healthy immune system as well. When choosing a probiotic, look for the dosing information, otherwise known as the CFU count. CFUs refer to the number of good bacteria in the supplement. For example, on the lower end, probiotics with 2 billion CFU can help support everyday digestive health, while additional CFUs on the higher end can help bolster immune support. To find out what kind of probiotic is right for you, take a quiz at swansonvitamins.com. STORING AND DISCARDING: Rethink where you keep your medicines. Humidity from steamy showers can expedite the expiry of medication. It’s best to keep them in a child-safe, dry, and cool place. And landfill sites and water supplies have become contaminated with discarded medicines. Participating in a community drug take back program or a trip to the pharmacy are the best ways to discard old or unneeded medications.